Pakistani police stand beside the wreckage from a suicide car bomb in Peshawar on Tuesday. (CNN) -- A senior al Qaeda leader in Afghanistan has blamed the U.S. security firm formerly known as Blackwater as being behind the recent spate of deadly attacks in the Pakistani city of Peshawar. An audio message said to be from Mustafa Abu Yazid, released Thursday, said Muslims could not have been behind the attacks, because they are fighting to protect the honor and lives of other Muslims. The Mujahedeen, as Abu Yazid called the militants, target only security forces who are far from civilian gathering places, he said. "Today, everyone knows what Blackwater and the criminal security contractors are doing after they came to Pakistan with the support of the criminal, corrupt government and its intelligence and security apparatus," Abu Yazid said. "They are the ones who commit these heinous acts, then accuse the Mujahedeen of their crimes." Abu Yazid is al Qaeda's commander of operations in Afghanistan and its No. 3 man. The tape was posted on several Islamist Web sites, known to carry statements from the radical Islamic group. CNN could not immediately determine the authenticity of the tape. Blackwater, now known as Xe, is a ready bogeyman for Pakistanis who cite the company's actions in Iraq as evidence of its malevolent intents in their country. Iraq refused to renew the license of the private security company after its security guards killed 17 civilians two years ago. Peshawar -- the capital of the North West Frontier Province -- has repeatedly come under attack in recent days. Intelligence officials say the attacks are retaliation against an army offensive to rout militants from their havens along the Pakistan-Afghanistan border. On Tuesday, a suicide car bomber struck a congested traffic circle outside Peshawar, killing at least 26 people -- including children -- and wounding 60 others. 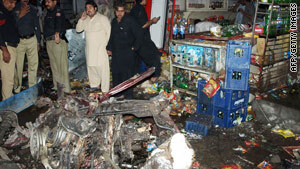 A suicide bombing at a police checkpoint on Peshawar's Ring Road killed at least three people Monday. A suicide car bombing killed 17 people in the city Sunday, including an area mayor. And on October 28, a massive car bomb tore through the heart of a bustling marketplace in Peshawar, killing at least 100 people and wounding at least 200 others.